It's that time again - time to chat about another Batty Book! This time, when Kathy (aka @TheBrainLair) and I announced our book selection, another buddy decided to join in the fun. So help us welcome Sherry (aka @LibraryFanatic) to the Batty fold. I haven't met her in real life, but I can assure you that she's just as Batty as we are! As is tradition, we have a "Batty About Books" image. Kathy put three bats on this one, instead of our usual shoes because Sherry doesn't have the Batgirl shoes! My thoughts reside here, in purple. Any of Kathy's responses are in blue, and Sherry chose green. Check out the rest of the discussion by visiting The Brain Lair for Kathy's thoughts with our responses and Library Fanatic for Sherry's. We decided to start our discussion of each book by giving our thoughts about cover appeal. Maria says: It’s big, bold, and over the top silly. I like that about it. I also think it’s clear from the cover that it’s a departure from what we’ve been reading lately. I love all the circuitry on the enormous robot, and the evil glint in its eyes. The matching “S”s on the shirts of the boys makes it feel like they are part of some kind of super powered club. (Confirmed by the copy on the back, of course). I also like how the three boys have different sizes and shapes. How often do we see that when there are girls on a cover? I have to admit, I’m looking forward to a funny story. Yet I’m always slightly cautious about mocking and/or stereotypes when it comes to two major categories - girls and geeks. Can Mike Jung give us a funny tale without resorting to this? I’ve heard great things about the book, so I’m ready to dive in. Kathy: I’m with you Maria! 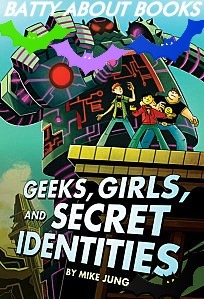 I want to see girls and geeks lifted up and out of the stereotypes! I want a fun read without them being made fun of! I have only read the first line of the inside jacket and nothing else so I had no idea what the book was going to be about! I saw the cover (got an ARC from Scholastic) and immediately brought it home!! I bought the hardcover because I really wanted to see the final art! I was jazzed to start this book. While the superhero/ fantasy theme is something I read frequently, I was definitely in the mood for a comedy. I’ve been reading a ton of books from a girl’s perspective (and it’s awesome that I can find enough books to do that! ), but I like to mix it up with books from a boy’s POV too. The fact that it made the list of Charlotte’s Library blog post Looking for Kids of Color in MG Sci-Fi/Fantasy books made me even happier. So I took a deep breath and reminded myself that the characters who are speaking are middle school boys. While I hope and pray that things will get better, middle school is a time when stereotypes rule. I decided to continue with the attitude that this would be a lesson they could learn during the story. I’m glad I wasn’t the only one who felt this way. I’m determined to wait it out and kept reminding myself this was only the beginning, but I was disturbed by the girls like clothes and pretty things attitude. Armed with my slightly calmer mindset, I read on. The humor level is very entertaining. It is a bit of an odd feeling trying to have this type of book chat about a funny book. The ones we’ve done before have been deep and rich (or not), but humor wasn’t their primary objective. I love the snarky dialogue between the characters. I love the fact that I feel like I’m in a comic book - but I’m following the common masses instead of the characters with the powers. (Though I did LOVE The Cloak Society). I’ve gotten so many chuckles out of this first third of the book that I’m sure my students will adore it. I can see it being a fast read. One you sit down and laugh through but with some “seriousness” thrown in. Jung has brought up Max’s and George’s home life several times and I wonder if this will serve to “ground” the novel. I do LOVE the humor in this and it’s very welcomed after so many serious reads! I do love the humor and the illustrations so far! This has been a fun read so far, and I’m looking forward to reading the rest and getting this book into the hands of my students. Kathy, Sherry and I had some discussion over the aspect of the plot that was “Spoilery”. Kathy did some poking around, and discovered that the plot point is mentioned a lot - many different places that readers would go to learn more about the book and decide if they wanted to read it. So - what exactly IS a spoiler? And does hearing one ruin your enjoyment of a story? Does it matter what kind of spoiler it is? This sounds like a great topic for a separate discussion! In the meantime, check out the link below for information from a study about how spoilers impact your enjoyment of a story. (This study claims that they don’t “ruin” it!) What do you think?